When it comes to movement in a gym based or rehab setting, it is common to see trainers and physical therapists coaching very specific techniques in which certain body parts move in very specific directions. An example is a lunge; stand in a staggered stance, keep your knees tracking over the 3rd and 4th toes as you drop your trail knee towards the floor. Finish the movement by standing tall while maintaining the angles described above. But in life and in sports, this isn’t how things work. In any sport, cutting and changing direction causes our knees to go into a valgus position. This is normal and natural, but it can place high forces to be placed on the body in that position. Even when we lunge down to pick something up, it isn’t always going to be “perfect” form, whatever that really means. The underlying principles behind CAFS is that the body is a chain. This means that movement in one area in the body should create motion at all others as well. These are anatomical truths and can be utilized to help improve mobility and strength at joints throughout the body. They utilize 8 global movements and, what they term, the 10 observational essentials as variables you can modify to create any effect you want within the human body. By mixing the variables above you can progress, regress, and assess, as needed, to help select exercises that are appropriate for the individual in front of you. I love this ideology, as I do not believe there is a one-size-fits-all approach to exercise selection Every person’s starting point will be different, and we need to vary our plans in order to help them have success. Just take the lunge example from the beginning of this post. Is there really one way to lunge. What happens in a wrestling match when someone tries to take you down and you have to lunge down to prevent it? Are you gonna do a perfect lunge? What about the 50 year old with poor hip flexion and ankle mobility? Are the going to be able to perform the ideal lunge? We must be assessing the demands of the person in front of us and ask the questions, what is appropriate for this person? This is another excellent point the Grey Institute makes; when assessing and programming, the goal is to stay at the threshold of success in order to build capacity. Find out where a person fails, and bring them as close to that point as possible to get a positive training effect. Sounds an awful lot like progressive overload, no? Starting them at a level above their capacity and it will limit their potential to make progress and potentially discourage your client. Starting them too easy will not challenge the person enough to make an adaptation. You will probably lose this client as well. I find that many movement providers struggle with this concept. People often progress people too quickly reinforcing dysfunctional movement. The last concept that I really liked from the CAFS course was - there are no specific rules to movement. Movement is designed to be free, flowy, and requires you to “load and explode” through movement. The CAFS system defines Load as the eccentric muscle action during the movement, and the Explode as the concentric muscle action. The idea is that during movement you should be able to smoothly transition between the two types of muscle contractions without having to stop or hesitate. The entire CAFS system is about mobilizing the entire body through tri-planar movement since all joints are tri-axial in nature. What they mean by this is that every joint is affected by all 3 planes of motion, and if there are any limitations in one of them it can cause increased stiffness and/or a decreased ability to “load and explode” with movement. An example here is the squat and lunge patterns. We hardly ever train them outside of the saggital plane, and if we neglect the frontal and transverse planes for long periods of time it can lead to dysfunctional movement. 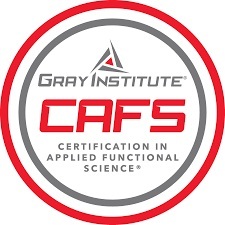 Overall we really enjoyed the CAFS course and would recommend taking it. It was informative and gave us usable information that we could instantly apply to our practice. The only downfall in my eyes was that this seminar seemed to miss the gap between body weight mobility training, and higher level loading that helps prepare your body for activities that require high levels of force such as running, jumping, cutting, and resistance training. Looking for a better way to train yourself? Look no further than the Perfect Stride Physical Therapy Online Training Program. Designed by Physical Therapists to help you move better, while improving your strength and mobility levels. Click below for more information.